One company dominates all the rest in the quest for consumer budgets—Amazon. The secret to this success is laser-focused on one objective: delivering a customer experience that converts. But how do they do it? 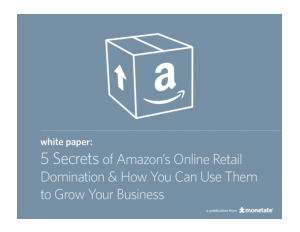 This white paper examines five features and sales tactics that Amazon uses to convert shoppers (and five tactics it doesn’t use) to show you how you can achieve equal?or even higher?growth rates than Amazon.